Download "3. Write the full forms. I m Laura... He s my brother... She isn t at home... It s your seat... What s that book called?... They re friends..."
7 TEXT 1 Alex Fernández is a footballer. He is Argentinian but he plays football for Leeds United in England. He is maried and he lives in Leeds with his wife, Elena, and his baby son, Daniel. His wife teaches Spanish at an English school in Sheffield. His family lives in Buenos Aires. His father is a doctor. 1. Is Alex a tennis player? 2. What does he do? 3. Does he come from Spain? 4. Where is he from? 5. Does he play football for Manchester United? 6. What team does he play for? 7. Does he play in Scotland? 8. Where does he play? 9. Is he married? 10. Does he live in Liverpool? 11. Does he live in Buenos Aires? 12. Does he live alone? 13. Is his wife s name Ana? 14. What s her name? 15. Do they have any children? 16. What s their baby s name? 17. Is his wife a doctor? 18. What does she do? 19. What does she teach? 20. Does she teach at a Spanish school? 21. Where is the school? 22. Does his family live in England? 23. Where do they live? 24. What does his father do? TEXT 2 Raúl García works five and a half hours a day. She gets up at 8.30 a.m. and has a big breakfast. At 9.30 she leaves home and goes to a sport club. She plays tennis with her coach from 9.30 to midday. She has lunch from 12 to 2 and then rests for an hour. At 3 p.m. she plays tennis again until half past five and then she rests. At 6 p.m. she does ninety minutes of exercises and then goes home. She has dinner at 9 p.m. and goes to bed at p.m. 1. Does Ana work for seven hours a day? 2. How long does she work for? 3. What time does she get up? 4. Does she have a big breakfast? 5. What time does she leave home? 6. Does she go to a football club then? 7. Where does she go? 8. What time does she start to play tennis in the morning? 9. What time does she have lunch? 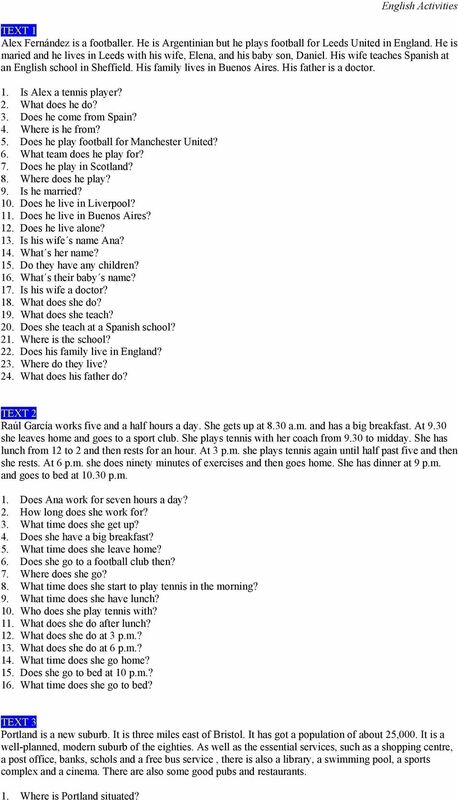 10. Who does she play tennis with? 11. What does she do after lunch? 12. What does she do at 3 p.m.? 13. What does she do at 6 p.m.? 14. What time does she go home? 15. Does she go to bed at 10 p.m.? 16. What time does she go to bed? TEXT 3 Portland is a new suburb. It is three miles east of Bristol. It has got a population of about 25,000. It is a well-planned, modern suburb of the eighties. As well as the essential services, such as a shopping centre, a post office, banks, schols and a free bus service, there is also a library, a swimming pool, a sports complex and a cinema. There are also some good pubs and restaurants. 1. Where is Portland situated? 8 2. Has it got a population of 2,000? 3. What is the population? 4. Is it a well-planned suburb? 5. What essential services are there in Portland? 6. Is there a library? 7. What other facilities are there for free time activities? 8. Are there any good pubs and restaurants? TEXT 4 Oxford is the most popular tourist attraction in Britain, after London and Stratford-upon-Avon. Oxford is famous for its university. It is the oldest in Britain and the third oldest in Europe. The university has thirty-five separate colleges. For many years, only five of these colleges were for women. However, nearly all the colleges accept nowadays both men and women. Oxford is also a market town, where ordinary people live and work. Oxford has over one million visitors a year. 1. Is London the most popular attraction in Britain? 2. What is the most popular attraction in Britain? 3. Why is Oxford famous? 4. Is Cambridge the oldest university in Britain? 5. What is the oldest university in Britain? 6. Does Oxford have twenty separate colleges? 7. How many colleges does it have? 8. Were the colleges in the past for men and women? 9. How many of these colleges were for women? 10. Do nearly all the colleges nowadays accept both men and women? 11. Is oxford also a market town? 12. Does Oxford have three million visitors a year? 13. How many visitors does it have a year? 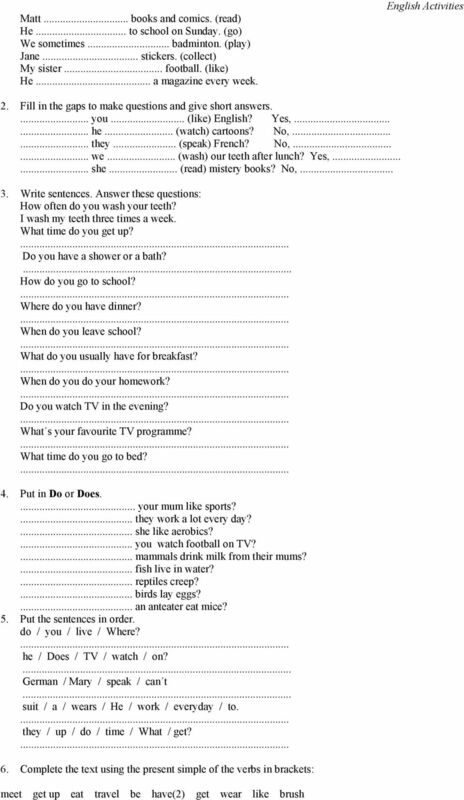 Past form of Verb To Be A) Fill in the blanks. Use WAS / WERE: 1. Martin and Sam were ill yesterday. 2. The weather.. very cold last year. 3. My brother and my father.. at the cinema last night. 4. Benson.. Positive Negative Question I am working. I am not working. Am I working? You. you We. are not cooking. Are. cooking? They. they He. he She. eating? Worksheet Present continuous Positive Negative Question I am working. I am not working. Am I working? You You you We are cooking. We are not cooking. Are we cooking? They They they He He he She is eating. A) Complete the sentences with SIMPLE PRESENT or PRESENT CONTINUOUS. Nombre: I am not playing. You are not (you aren t) eating. He is not (He isn t) reading. She is not (She isn t) sleeping. My living day Hello, my name's Nouhaila. I get up at seven o' clock and I wash my hands and my face at quarter past seven. I have breakfast at half past seven, then I get dressed at twenty-five to eight. 3a Order the words to make questions. b Check your answers. c Practise saying the questions. Nombre: Today is Monday. Yesterday was. Tomorrow will be. Today is Friday. Yesterday was. Tomorrow will be. Today is Wednesday. LOS ROBLES. El presente cuadernillo debe ser realizado en el mes de febrero, dos semanas antes de empezar las clases. 1. What do they do? 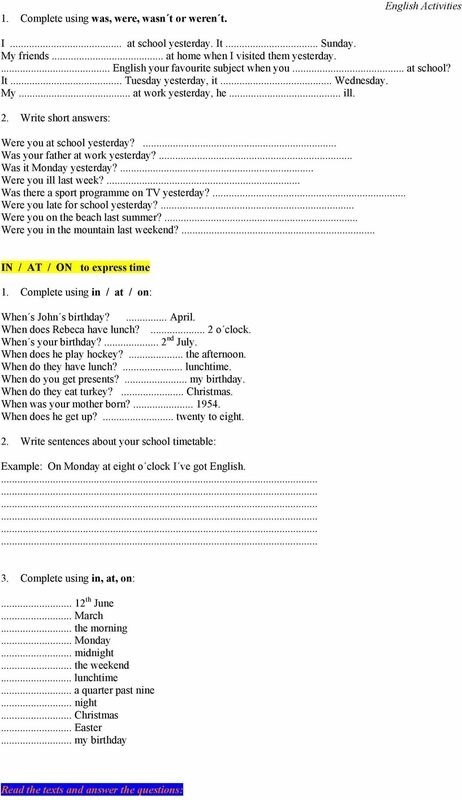 Write the sentences from the box into the correct columns. 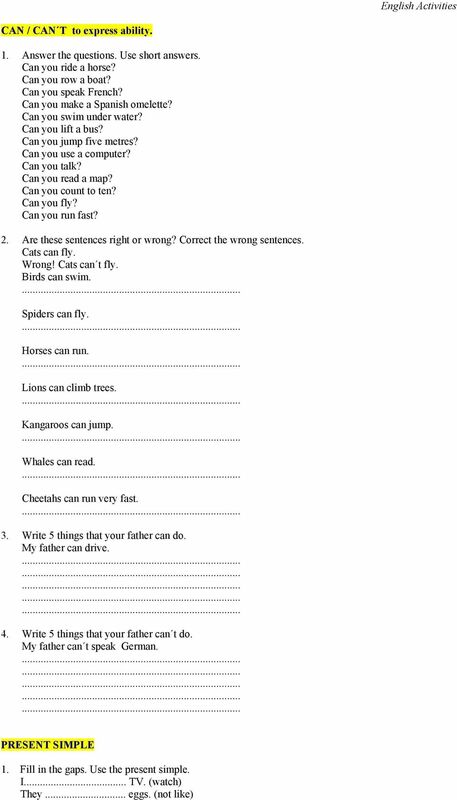 Grammar Worksheets Elementary School 1. To be: affirmative, negative, questions A. Complete the sentences with to be 1. I a girl. 2. My father at work. 3. Alex and Dino my cats. 4. Alex in the garden. GRAMMAR A. 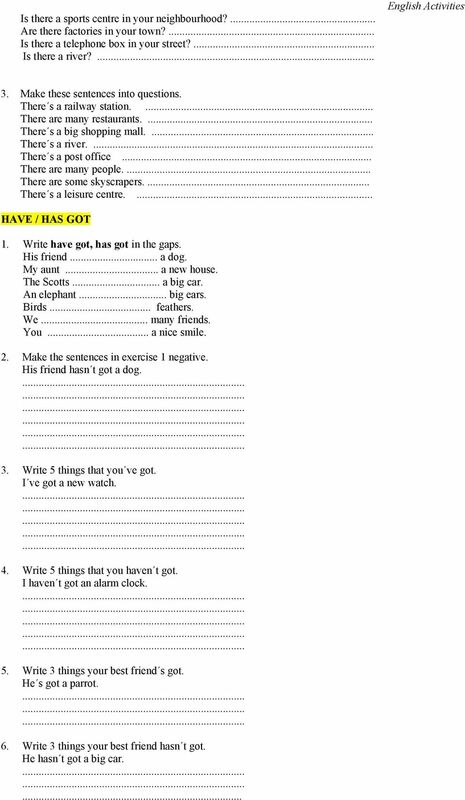 Complete the sentences with the correct form of the verbs in brackets. 1. My mother LIVES in Paris because she LIKES cities. (live, like) 2. Rudy DOESN T E-MAIL me but he PHONES me every week. THE PRINCE AND THE PAUPER. 1. The story happended in the middle of sixteenth century. 5. All people took a holiday to celebrate this great event. The olympiad s work (form 5) Read the text! THE PRINCE AND THE PAUPER I am going to tell you a story that took place many, many years ago. It was told to me by my father, who heard it from his father. Interview Questions for Secondary Schools Interviews PART I 1. What is your name? My name is Lu Kin Tsang. My English name is Donald. 2. How old are you? I am twelve years old. 3. Where were you born? 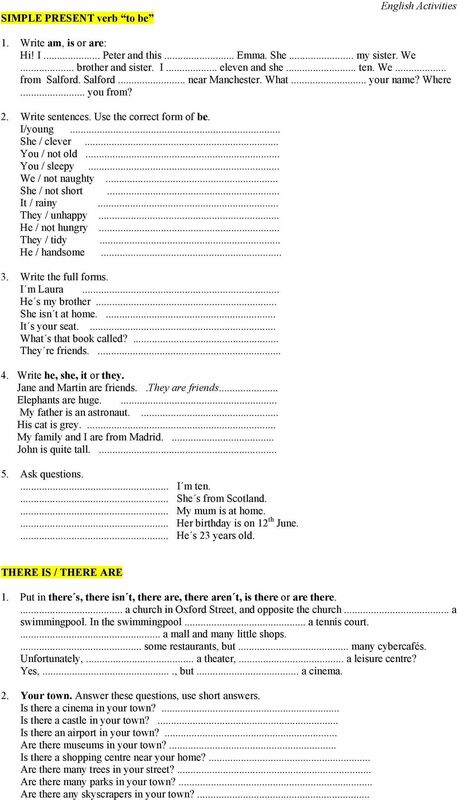 Subject pronouns and possessive adjectives. Fun! FFun! y words. My Picture Dictionary. Free time activities. 1 Complete the words. s i ng in a b a n d. pl b d mes. d cart. m jewe. oll rds. Would you like to play tennis with me after school, Peter? I can t, Jane. I have to go straight home. How about tomorrow, then? 2 2 1 3 1 1 1 Would you like to play tennis with me after school, Peter? I can t, Jane. I have to go straight home. How about tomorrow, then? 1 We can go today after school. 2 I don t have time today. 1.- Complete the stories. Use Simple Present and Present Progressive. 2. 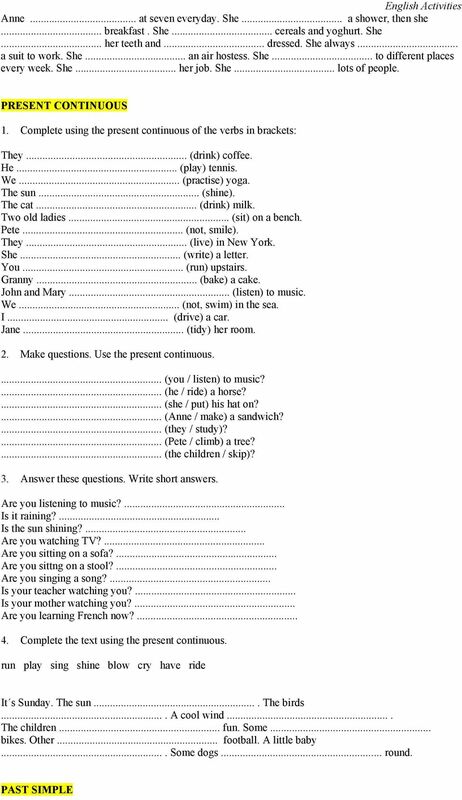 Complete the sentences with the past simple form of the verbs. ATTENTION! Please cover the grammar part below before you start doing the exercises in the class. Servicio de Inspección Educativa Hezkuntzako Ikuskapen Zerbitzua 2 0 1 1 / 1 2 DIAGNOSTIC EVALUATION 4th YEAR of PRIMARY EDUCATION ENGLISH LITERACY Name / surname(s):... School:... Group:... City / Town:. Nombre: SIMPLE PRESENT AFFIRMATIVE. Subjet + verb (3 sing +s, or es) NEGATIVE. Subjet + do/does + not+ verb INTERROGATIVE. Do /Does + Subjet + verb? Past tenses practice. Past tenses While, during, for Passive Prepositions in, at, on for time Adverbs. rtzrtz Jahrgangsstufentest Englisch 2003 Jahrgangsstufentest ENGLISCH an bayerischen Realschulen Termin: Dienstag, 16. SET 7 CANDIDATE A TASK 1 MONOLOGUE Please introduce yourself to the other candidate. You are going to give a short talk on a topic. Choose two or three ideas to talk about. You can add your own ideas. Which of these should be written as two separate sentences? Tick one. Kate hurt her ankle she slipped off the kerb. I went to ASDA and McDonalds.